One of my nearby local parks has a great selection of tree species, scattered beautifully across its modest expanse. It was here that I came across a mushroom more typically found in a woodland setting. Although not in woodland, these Blushing Wood Mushrooms (Agaricus silvaticus) had set a comfy foothold near several coniferous trees, enough to satisfy their happy mychorizzal relationship. They were scattered in a small group, so I didn’t want to over pick, just wanted sample a few of these edible and ‘good’ mushrooms. These mushrooms are quite easy to miss as the scaly ochre-brown caps tend to blend into the background of soil and fallen needles. Luckily, a few tufts of grass helped me spot them easily. 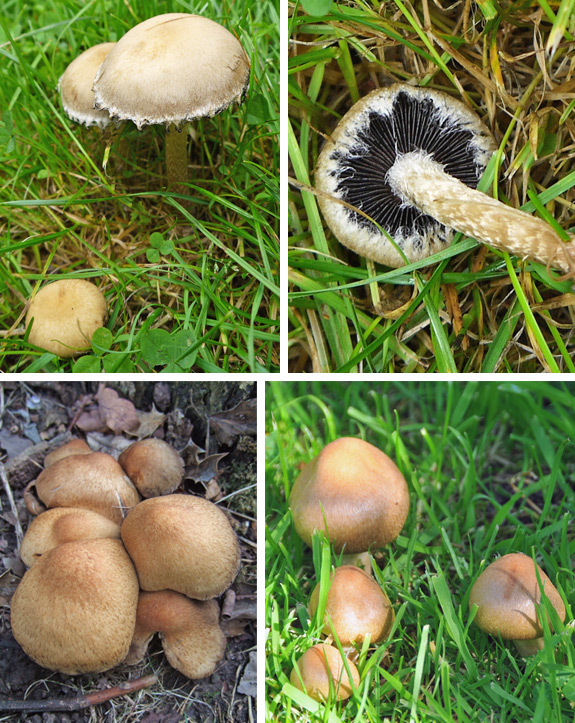 Initially I discovered the larger, more mature examples growing at my feet, with brown/dark brown crowded gills under wide, flat caps; up to 10cm across. So I sought out the younger specimens nearby to see what I was dealing with. 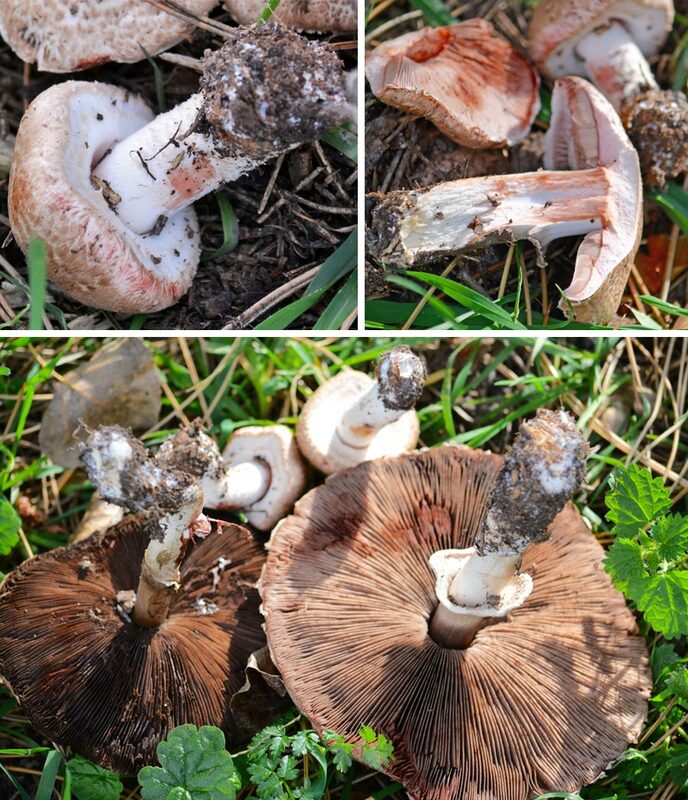 After seeing the reddening on the damaged and exposed flesh, the colour of the gills (pale in young to darker brown when mature), I knew it was an Agaricus species. Iinitially I wasn’t 100% sure it was A.silvaticus because I knew the Scaly Wood Mushroom (Agaricus langei) was so similar. Also, I’d only ever seen A.silvaticus before in woodland scenarios. But this A.langei lookalike was slightly bugging me; its flesh also turns red on cutting/exposing the flesh, but happening more slowly. In the end I was satisfied it was A.silvaticus because the reddening here occurred much quicker. And from a foragers point of view, being unsure whether it was either of the two, they are both edible and good. 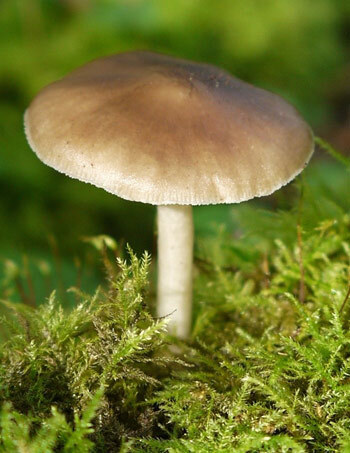 A smell test will help confirm too; the more stocky A.langei has a distinctive pleasant ‘mushroomy’ smell where as the Blushing Wood mushroom is nothing special – quite bland and indistinctive. I wanted to find out more about their edibility, possibly to find any recipes that may be floating around the internet. I know many edible mushrooms are very nutritional, and some which have very impressive health benefits. But I didn’t suspect this species was one of them. 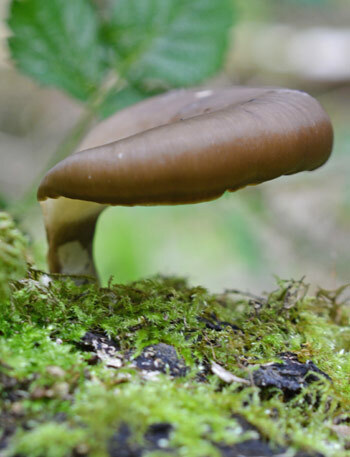 As part of a balanced diet, Blushing Wood Mushrooms are being used to help in the recovery of cancer patients. Along with a high proportion of protein, they also contains a high content of essential minerals, making it a very effective supplement with great antioxidant power. To read further see the article on ‘Wild Foodism’: What Agaricus silvaticus, The Blushing Wood Mushroom, Does For Cancer Patients. With health benefits like this, it makes things all the better – they were a tasty addition to my fry up (or grill up – doing my best to be extra healthy – or not!). But I must apologise because this has been a delayed post, and if you’re reading it close to when published (ie. late November) you may have to wait until next summer/autumn for a chance to find them again. Sorry! Blushing Wood Mushroom – Agaricus silvaticus. Notice the reddening of the flesh, which eventually turns brown. 5-11cm across, covered in light brown fibrils which expand into larger soft flat scales. Initially rounded, expanding flat. Flesh is white, quickly turning red when cut. Bland, indistinctive smell. 5-8cm x 1-1.2cm. Whitish. Ring 3/4 up, sometimes with brown fibrous scales beneath. Pale when young, then reddish, eventually brown at maturity. In mixed woods, or parks near trees. Summer to autumn. Many bracket (or shelf) fungi grow all year round, or at least from spring through to autumn. This one is a classic example – most common in central Europe but less so farther north. The Bay Polypore (Polyporus durus / P.badius) can be found throughout this long season. I live in middle England and find them ‘now and again’ – they’re one of the few ‘good looking’ polypores out there, as many can be quite dull and inconspicuous with bland colours. The size of the mature fruiting body can differ greatly, ranging from 5cm up to approximately 20cm across. The first group of photos below show several examples from the same group, all different shapes and sizes. The typical ‘off-centre’ stem (which is mostly black – or at least at the base) produces a thin, lobed and often wavy cap. It’s very smooth with a very slight ‘waxy’ feel. The colour also varies with many shades of brown and mahogany. Age is also a key factor in these variations too. When young, the fruiting bodies are pale/pallid brown becoming dark brown/mahogany at maturity. The first group of photos here show some ‘rich’ dark brown examples – so much so that I had to get a second opinion and microscopic confirmation from the spores. They were indeed Bay Polypores, just darker than usual. As a rough ‘general’ colour guide I would say they’re most often a mild pallid brown, often with darker central zone. But when it comes to identification, fungi like to keep you on your toes! As many of you will know (or may not know) fungi such as these do not have gills on the underside but have pores instead (from where their reproductive spores will drop). ‘Polypore’ simply translated means ‘many holes’, and in this case they are very small holes; around 5-10 per millimetre! So at first glance the underside looks like a smooth creamy white, featureless surface. You have to take a closer look. And like most polypores, they only grow on tress, trunks or fallen logs etc. In this case the Bay Polypore will only be found on dead or living deciduous wood. 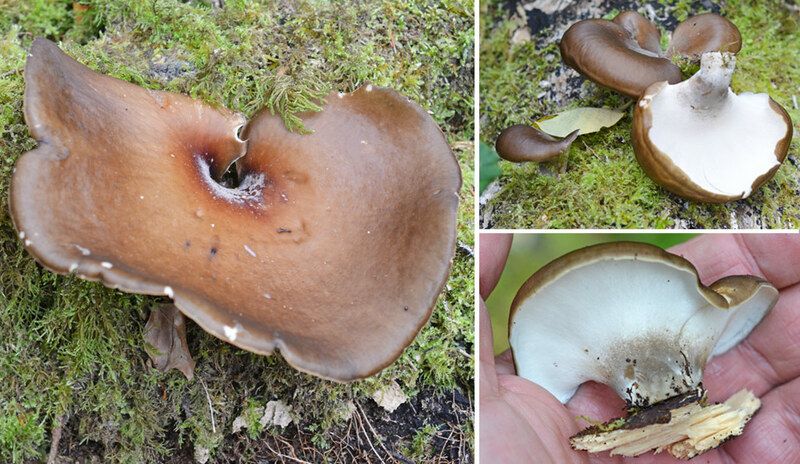 You may also stumble across the Blackfoot Polypore (P. leptocephalus) which I find is a more common species but essentially smaller (cap ranges from 2-10cm across) and much paler with radiating streaks on its surface. It is also found on dead/dying deciduous wood, but not living trees. Bracket fungi for foraged food? Well, to be honest, there are not many bracket fungi out there for the pot. Many are too thin, too tough, too bitter or all of the above! Never mind, I’m sure they appreciate not being eaten to carry on they’re great ecological work. So, keep a look out for all those variable brackets out there this spring, summer and autumn (especially on fallen trunks). Enjoy. The typical wavy/lobed shape of the Bay Polypore. Notice the dark/blackish stem base. Older examples of the Polyporus durus – Mahogany brown in colour and extreme wavy/lobes edges. 0.2-0.4cm x 0.5-1.5cm, off centre. Black(ish) more so at the base. Very small, circular (5-10 per mm). White/pale cream. On dead or living deciduous trees. Spring to autumn. Not edible. Too tough and bitter. • Nearly all are bracket fungi, but a few are with typical cap and stem but with pores instead of gills on the underside. • Usually tough/leathery or hard and woody. This common wood-rotting mushroom has a variable season. It is prolific in summer and autumn, but if conditions are mild enough, it can appear as early as April or early winter if the weather is favourable. The Deer Shield or Deer Mushroom (Pluteus cervinus) is one of the most common Shield mushrooms; and like nearly all of this genus, it is found on dead wood, stumps, logs and also wood chippings. It is a saprobe; getting nutrition from the dead wood and essentially breaking down the organism. It’s all part of life’s beautiful tapestry. 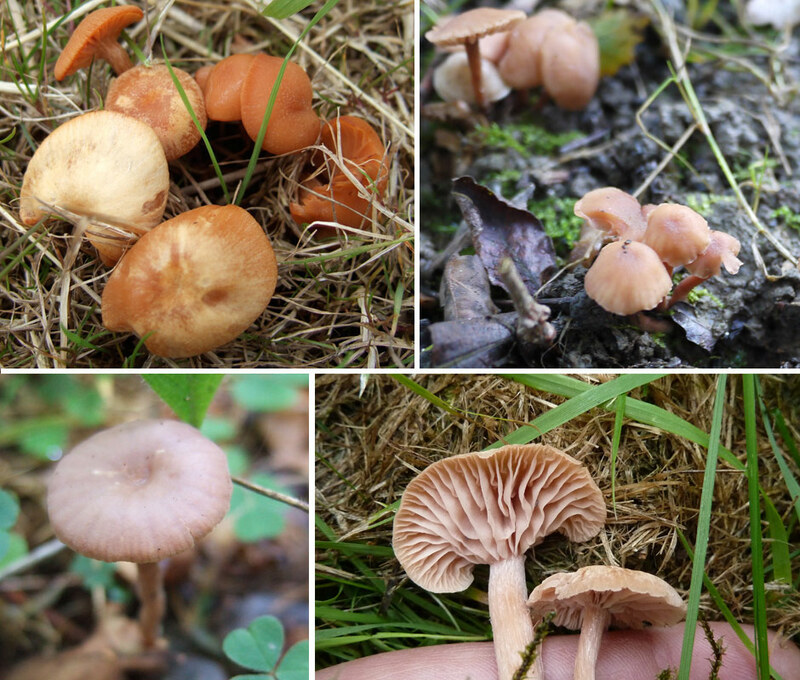 The cap of this particular Pluteus is smooth with variable colouring; mainly shades of brown (fawny like), but it can be paler and young specimens can be quite dark, as shown in the photo below. Subtle streaks can be seen radiating around the surface. Most often there is a slightly prominent central bump (umbo). All mushrooms in this genus have a pink spore print and their gills are ‘free’ from the stem (See my other post on the Willow Shield mushroom here). They are initially white in colour, but over time they take on a pinkish hue as the spores mature. This is a good identification characteristic, albeit dependent on its age! Look around for older specimens if you can. 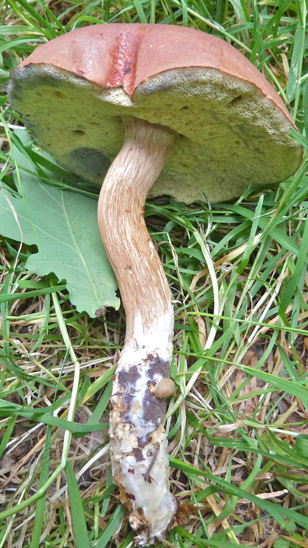 The stem is white and often becomes streaked with darker yellow-brown fibres as it ages. Also take a look at the base, where it usually is slightly swollen. When I was first aware of the common name, I assumed that ‘Deer’ was simply in reference to the colour. But apparently this is not so. Under the microscope, small cells (known as cystidia) present on the edge of the gills, show long protusions that are crowned with two tiny ‘horn’ shapes which resemble antlers – hence the ‘deer’ reference. Cervinus is also derived form cervus which is Latin for deer. You learn something new everyday! I hope have luck finding these handsome mushrooms some time soon, as well as any others you may find along the way. Enjoy. Pluteus cervinus – The Deer Shield. Top middle: a Younger convex/darker example. 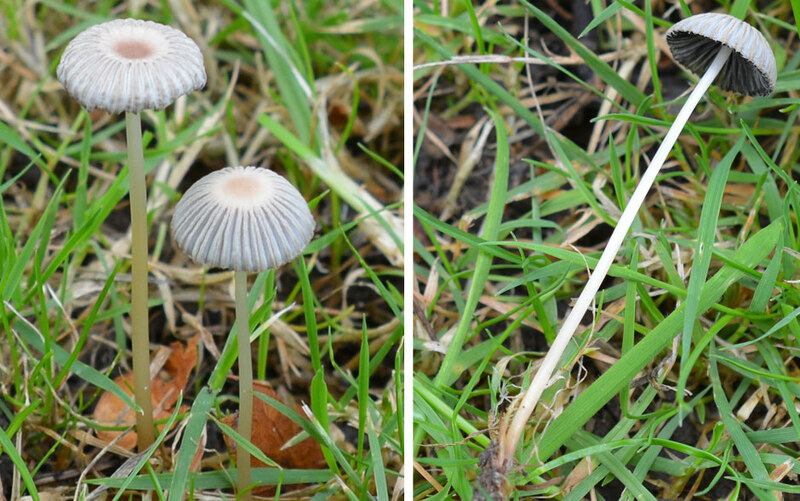 Bottom: Giils initially white, turning pink as the spores mature. 4-12cm across. Initially bell shaped/convex; flattening out with age, Often with a raised central bump (umbo). Flesh is white; smells and tastes faintly of radish. 7-10cm x 05-1.5cm. White; later becoming streaked with darker brownish fibres. Free. Initially white, turning pink. Dead wood, fallen hardwood trees and sometimes woodchip. Mainly autumn but sporadic throughout the year. Very common. Edible. Not considered particularly good. • The majority grow on wood or woodland debris/wood chippings etc. This is another species I often find in urban locations as well out in woodland or the countryside, especially at this time of year in mild January or February months. The Tubaria species are often overlooked due to their small size and colour which helps them blend into their surroundings. The Scurfy Twiglet (Tubaria furfuracea) is one of, if not, the most common of all the Tubaria (Twiglet) species. Typically small, reddish brown, found in scattered groups on twigs in and around wood debris. These particular ones were just in front of a hedgerow amongst the damp twigs and leaf litter. I was particularly proud in spotting them as I was riding by on my bicycle at the time! They can also appear on chippings and deciduous woodland floors. The ‘Scurfy’ term relates to the fine flaky texture on the cap where velar remnants can be found on the surface. This often produces a dotted area around the margin (edge) of the younger cap, which is an attractive and useful identification feature. When young, the cap is rounded or dome shaped, soon expanding with noticeable striated markings. The flesh is hygrophanous, meaning its colour changes depending on the levels of water absorbed by the mushroom. It can become pallid or creamy white as it dries and ages (see images below). Sometimes you may see the entire cap fade to cream, which makes it appear to be some other species. Very odd! You may come across caps of older and/or larger specimens which drastically curl back on themselves, exposing their widely spaced gills outwards. Again, this is a typical feature often seen on the Scurfy Twiglet. Look closely at the gills – they have an adnate attachment (widely attached to the stem) but are also very slightly decurrent (running down the stem). 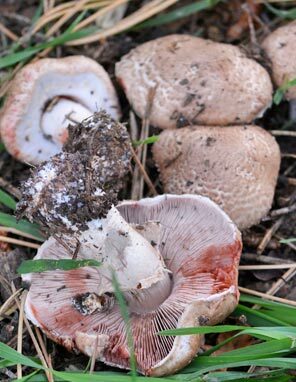 The stem is coloured similar to the rest of the mushroom and is covered in fine white down at the base which tends to cling to the surrounding substrate. Keep a look out for these guys, especially during the early months of the year. But as we’re well on the way to Spring now, there may not be many around now. Next year then! Note: I posted an article on the Winter Twiglet (Tubaria hiemalis) in February 2011, and I still believe it is. They are practically identical and hard to distinguish between in the field. The gills were not slightly decurrent like the Scurfy Twiglet, neither did it have any velar remnants. Without going back to take a closer look, I can’t be 100% sure, but they are very much of a muchness and are visually almost identical. Scurfy Twiglet (Tubaria furfuracea) Often late in the year, but also in February/March time. 1-4cm. Initially rounded/domed. Flattening out. Striate at edge. Margin curling upwards/central depression with age. Ochre/rust brown fading to pale ochre/cream with age. Minutely scurfy. Veil remnants. 2-5cm x 0.2-0.4cm. Similar colour to cap. Base covered in white down. Adnate, slightly decurrent. Yellow brown. Widely spaced. Spore Print: Pale ochre brown (see how to take a spore print here). On twigs, woody debris, chipping or mulch in gardens, deciduous woodland, hedgrows etc. Autumn through Winter. Happy new year to you all. It’s a typically dull and cold(ish) January and apart from the lovely edible Wood Blewit, Velvet Shank and Oyster Mushrooms around at this time, there are other groups of mushrooms to be seen, although not as palatable. The Common Bonnet (Mycena galericulata) is one of these mushrooms. Very common and present all year round, it is one of the larger Bonnets, growing up to 6cm across at maturity with a broad central umbo. It is often found in small or large clusters on broad-leaved stumps, branches and logs. It can be confused with the Clustered Bonnet (Mycena inclinata) which is very similar looking but only fruits from late summer to autumn, and is a much darker brown, growing exclusively on oak stumps. It has mild brown colouring, sometimes grey-brown with a slightly darker centre, and the margin is noticeably striated. It has white adnate gills which feature a tiny decurrent tooth. With age, the gills eventually turn pale pink as the spores mature. If you hold the cap up to the light you will also notice the gills are linked with many tiny veins (cross-veins), this is typical of several Mycena species. 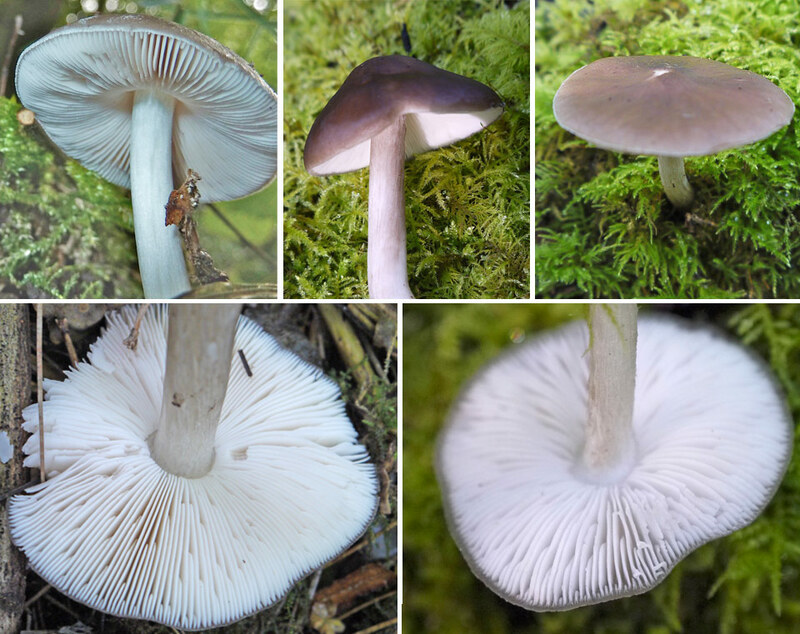 The stem shares the same colour as the cap but is clearly much lighter towards the apex where it meets the cap and gills and darker towards the base where it covered in fine white fibres. Although edible, I have heard this mushroom is unfortunately bland and not really worth it. The smell is sometimes rancid but the flavour can be mild. The problem is, they’re too delicate and not very substantial. Probably in a survival situation you could turn to them. Hey ho! Notice the wide central umbo and the conical appearance of the younger specimen. Bottom right: cross veining on the gills. Mycena or ‘Bonnets’ get their name from their appearance, which is similar to the bonnets worn by the Mycenae in ancient Greece. 2-6cm across. Brown to grey-brown. Initially conical, expanding to a broad bell shape with noticeable umbo. Paler at margin, striated. Flesh is white. 2-10cm x 0.3×0.9cm. Base similar colour to cap. Paler at the apex. Tough and hollow. Base covered in white fibres. Adnate (decurrent tooth). Initially white, turning pinkish. Stumps, logs and fallen branches of broad leaved trees. All year. Very common. Edible but not really worth it. • Small conical or bell-shaped caps (sometimes flattening out). Often with a slight central bump (or umbo). • Often cap edge has striations. • Long and delicate stem (some exude fluid when broken). • Also look for dark edges on the gills (not all Mycenas have this). • Some species found on rotting wood. Others on leaf litter and woodland debris. I’m catching up on reporting my mushroom foraging finds, especially from autumn last year, when the abundance of fungi is at it’s peak. I felt the next mushroom was definitely worth a mention. I had run in to so many of these brown beauties more than ever before – but only around oak trees, naturally. The Oakbug Milkcap (Lactarius quietus) as you’ve probably guessed, is exclusive to Oak woodland. They’re pretty easy to miss (or be stepped on) because of their smallish size and colour, which subtly blends in amongst the fallen leaves and surrounding soil. But when you find one, you suddenly notice more and more pop up in to your field of vision, scattered around the woodland floor. 2. The Cap: The reddish/brown cap grows up to around 8cm maximum but is often smaller, around 5 – 6cm. When younger the cap is rounded but it soon matures into a flatter shape with a distinctive (often shallow) depressed centre, inline with stem. But it’s main feature is that the surface is marked with concentric bands and/or spots. This is often apparent but can be subtle. Another interesting point is that it stays matt dry, even in moist conditions. So no sticky slimy characters there on a rainy day! Other points: The stem (often hollow) can be up to 6cm high and shares the similar colour with the cap but often darker, sturdy and compact. The gills are adnate / slightly decurrent. The milk is white and very plentiful and has a mild to slightly bitter taste (Note: Only taste a mushroom if you’re sure of it’s identity). The Oakbug Milkcap (Lactarius quietus). Notice the concentric banding and spotted marks on the sturdy cap. The cap is not greasy or slippery when wet. 3 – 8cm. Dry. Initially convex, later flat with depressed centre. Red/brown with concentric bands and/or spots. 4 – 9cm x 1 – 1.5cm. Cylindrical. Colour like cap, often darker. Hollow. Adnate/Decurrent. White/brownish, later reddish brown. Milk is white. Mild or slightly bitter. Smells oily. Spore Print: Clay – cream (see how to take a spore print here). Very common, on the ground near Oak tress. Autumn. Here we have a fairly common and sought after tasty mushroom for this time of the year. It likes to grow in dense clusters on stray stumps and logs of broad-leaved trees – Just like many other brown toadstools too! Hmm!? The Sheathed Woodtuft (Kuehneromyces mutabilis) has also adopted other common names, such as Velvet Toughshank, Brown Stew Fungus and Two-toned Pholiota, even though it is not strictly a Pholiota species. But I have seen it named as ‘Pholiota mutabilis’ somewhere else. It just goes to show that scientific names change from time to time as the scientific knowledge of fungi continually advances. And talking of scientific names ‘mutabilis’ literally means ‘changeable’ in latin. A good choice of name I think, because the caps of this mushroom which are ‘shiny and brown’ (even orange-brown – see last pictures below) when moist can change to paler ochre from the centre outwards as it dries. This gives them the characteristic two-toned appearance. On discovering any type of brown mushrooms on dead wood, most people become instantly suspicious. I don’t blame them at all. Unless you are familiar with other brown woodland species, identification can be a challenge. It has been known to be confused with Honey Fungus, Velvet Shank and Sulphur Tuft all of which grow in similar numbers on dead wood and share certain visual characteristics. The main identification concern here though is the deadly Funeral Bell (Galerina marginata). Nature has thrown this one into the mix just to annoy and terrify the average mushroom hunter. I don’t currently have any images to show, but if you look elsewhere you’ll see what I mean. The cap can look frighteningly similar in size and shape and also dries lighter brown at the centre (again, depending on moisture level). Fortunately, one reliable comparison is that it has a ‘smooth and silvery’ stem, whereas the Sheathed Woodtuft’s brown scales (beneath the ring) are unmistakable. Other features such as location, time of year, gills and spore print are not effectively reliable for comparison. So it goes without saying that if you intend to eat them, take extra care in the identification process. If you’re 100% happy just try a small portion first, leave it 24 hours to see how you go, just like you should with all mushrooms you eat for the first time. There’s always a small possibility of an allergic reaction, but fear not, for if it is the Sheathed Woodtuft, it won’t kill you! I have to admit, the general appearance of this mushroom hasn’t inspired me to eat it, but apparently it is known to be very good with a pleasant nutty taste. But I’m willing to give it a go soon. I think! A slightly younger and fresher group of Sheathed Woodtufts, much more Orange/Ochre in colour. 3-7cm across. Initially convex shape then flattenned out; often umbonate (with a small bump). Orange-brown to brown. Becomes lighter in the centre as it dries, giving a two-toned colour effect. 3-8cm x 0.5-1cm. Whitish at the apex, darker towards the base. Smooth above the ring, finely scaly below. Adnexed. initially pale then later cinnamon-brown. Spore Print: Deep yellow-brown (see how to take a spore print here). Edible and good. Take care not to confuse with Galerina marginata (The Funeral Bell) a deadly lookalike; focus on the stem differences. The summer days so far have been a concoction of showery spells, the odd storm and quite a few blazing hot stretches. So even though it has been drier out there in the woods I still venture out. And today I was happy to find a great Bolete specimen. The Bay Bolete (Imleria badia, previously Boletus badius) is one of the more common Boletes and fortunately one of the more tasty ones too. It can be found in all kinds of mixed woodland and has a season from July to November. So I was extra to happy to find one relatively early in the season. 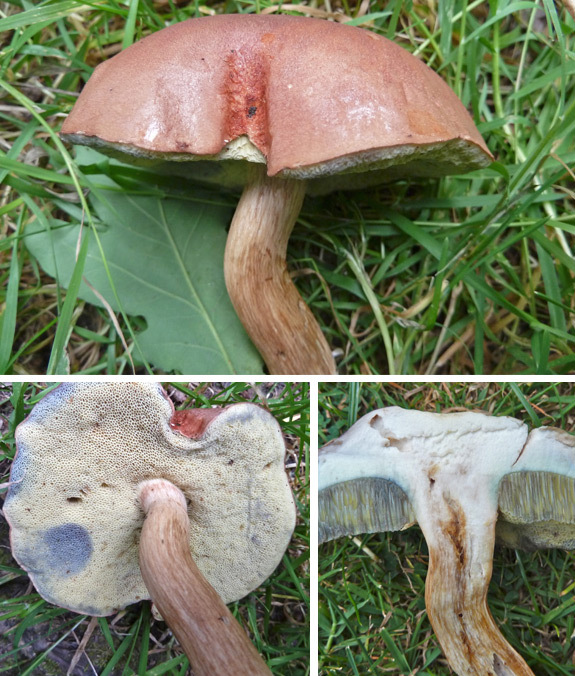 Confusion with Cep or Penny Bun (Boletus edulus) and even the Suede Bolete (Boletus subtomentosus) is understandable, but the Cep’s pores do not turn blue/green on handling. The Suede Bolete does have blueing, but the velvety feel of the cap differs to the smoothness of the Bay Bolete. The cap can range in size from 4 – 14cm in width, the specimen shown here was roughly 11cm and was a lovely ochre brown colour, smooth to the touch but slightly sticky when wet. It’s stem which is streaked with the same colour as the cap, is cylindrical and smooth. It can grow up to 12.5cm and the thickness can range from 0.8 – 4cm. Don’t miss out on the chance to grab a few as they’re great mushrooms to eat. It has a pleasant mushroom-like taste (smells mildly mushroomy too), and are especially more palatable when younger as the flesh is firmer. They are also good for drying too. 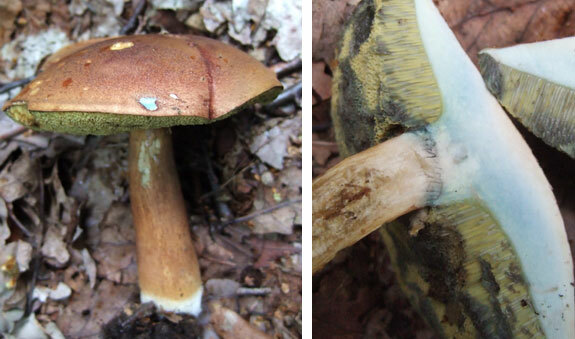 The Bay Bolete – Notice the blue brusing on the pores when handled, and the slight blueing in flesh just above the tubes when cut in half. This Bay Bolete is growing in the middle of the woods. Notice the shorter/thicker stem. It’s been cold this Winter – Damn cold! And there are few pickings out there for the mushroom hunter during any winter. But hold the phone, do not despair. There’s always some foraging delights to be had. The Velvet Shank (Flammulina velutipes) is quite a common mushroom who’s fruiting season is mainly from September to March. It can resist the winter frosts and low temperatures, even continuing to survive after being frozen solid. Quite a trooper! 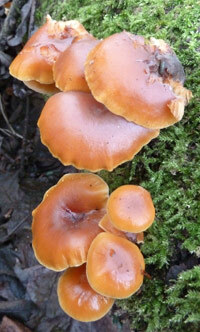 These beauties are usually found in medium to large ‘tufted’ clusters on dead or decaying wood, favouring elm and oak. 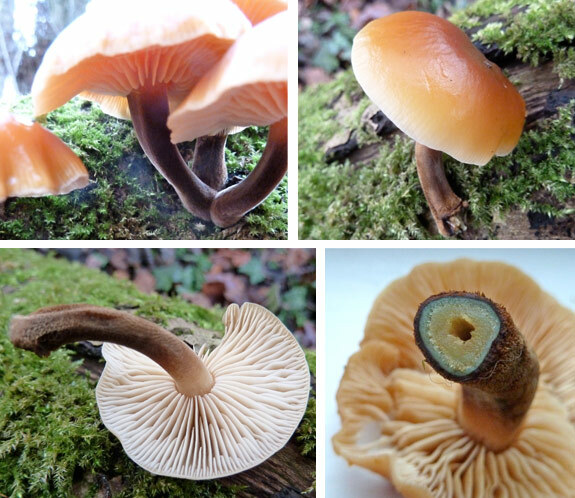 Their caps are a striking orange-brown colour (much lighter at the edges) and is quite shiny with a distinctly sticky/tacky surface texture. Normally I wouldn’t touch any mushroom or toadstool that falls into the ‘small brown mushroom’ category! Even though Velvet Shank isn’t exactly small (3 – 10cm cap diametre) my instincts at any other time of the year would tell me to avoid as some small brown species are quite nasty! But in this case, and at this time of the year (January to be specific) there is no fear of mistaking it with much else. The defining factor in identification of this mushroom lies in the examination of the stem. As the common name suggests, it’s ‘shank’ or stem has a smooth (and strangely satisfying) velvety feel, and the colour is a very dark brown/black – lighter at the top (closer to the cap) and darker at the base. Other identification factors regarding the tough stem is the lack of any ring, and when cut in half horizontally, it will show different coloured, thick layers with a small central hollow (see the picture below). If you’re still not sure, take a spore print. It will show up white. After collecting a few of these, I’ve decided to dry them out and then make a powder from them for later use (or maybe slow cook them to add to a Chinese dish). I’ve heard that this is what they are best used for. You can cook them but they lack any real flavour. The caps are best chopped into strips and added to soups. The Japanese can’t get enough of them and cultivate a form of the Velvet Shank in high quantities, commercially known as Enoki-take.